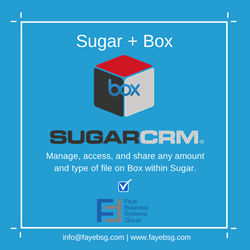 SugarCRM Platinum Partner Faye Business Systems Group unveiled their Sugar Box integration in early 2014. Today, FayeBSG has released a highly anticipated Version 2 of the integration including enhanced features with updates to the integration and improved functionality. FayeBSG is known for their innovative software integrations with SugarCRM. Their Sugar Box Integration Application has exceeded the needs of many organizations looking to marry Box for their storage and cloud collaboration solutions and Sugar for their customer relationship management. In the newest version of the Sugar Box integration, users now have the ability to send quotes directly from Sugar to Box, as well as having the options of more advanced mappings; including being able to store the contact folder by name under their related/parent account. Additionally, users of the integration can now have unlimited dashlets in Sugar 7, including one dashlet for each mapping or folder. The FayeBSG SugarCRM Box Integration Application can manage, access, and share any amount and type of file on Box within Sugar, ensuring sales teams have the most up-to-date materials. Users can also create shared workspaces within Sugar to collaborate with colleagues, partners, and customers. In addition, users can email files, edit documents, fax agreements, and sign contracts within Sugar. Organizations can manage all documents and uploads for any record. The integration can map any field in a Sugar record to the corresponding Box folder. With the FayeBSG SugarCRM Box Integration, users have the ability to share, tag, edit, upload, and revise documents from within a Sugar record; then drag-and-drop file uploads, preview and tag documents…all right inside of Sugar. FayeBSG integrations allow companies to utilize best-in-class software without missing out on critical integration components. A 2014 Inc. 5000 Honoree, FayeBSG are software and technology specialists with extensive expertise in CRM and ERP software. A long time SugarCRM and Sage Platinum Partner, Faye’s in-house team of developers and consultants work on an ongoing basis to not only develop the most sought after integrations, but also to consistently upgrade and update integrations for optimal performance, and to add user requested features. Their integrations are well thought-out and consist of the most complete operational functions. FayeBSG uses SugarCRM, Sage 100 ERP (formerly MAS 90), NetSuite, and a variety of custom software solutions to meet client needs. Services include software development, project management, packaged software implementations, custom software implementations, integration, consulting, training, and support. Faye Business Systems Group has completed hundreds of successful CRM and ERP projects, specializes in Sugar Integrations, and is one of SugarCRM's leading North American Platinum Partners. For more information, call (818) 280 - 4820, email info(at)fayebsg(dot)com, or visit http://www.fayebsg.com. Connect with Faye Business Systems Group on LinkedIn, Facebook, Twitter or YouTube.